This adorable little plush jackrabbit is not only a great stand-alone stuffed animal, but is also a fun finger puppet that "comes alive" in your hands. 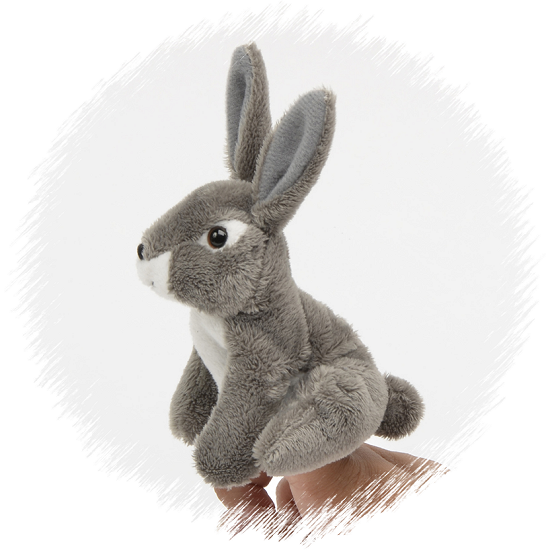 Great for storytellling and imaginative play, this stuffed jackrabbit finger puppet has soft gray fur, white chin, tummy, and eye spots, big floppy ears, warm brown eyes, and a never-ending smile. The "finger flap" tummy pouch lays flat when not in use allowing this sweet jackrabbit stuffed animal to sit up for traditional stuffed animal play as well.